Footaction and Nike's Jordan Brand teamed up to open a new store in Chicago, known as 32 South State Street, and held its grand opening last week. I first saw announcements for the store's opening all over Facebook a few weeks ago, and was immediately intrigued. The videos and teaser photos did as they were intended, made me eagerly await the opening of the store. Everyone knows I am a big fan of both the Nike and Jumpman brands, not because I am a sneakerhead or athlete, but because I am obsessed with mega brands and their cult followings. I like to see what they do to stay competitive, how well they adapt to market shifts, competition, embrace technology, and how well they attract new customers as well as retain old customers. Nike is my preferred brand of choice when it comes to athletic gear (when I buy it). It's crazy how a swoosh or the silhouette of a leaping Micheal Jordan, or Jumpman can create such buzz and hype, but I love it. Being a native Detroiter, I've been a lifelong Nike fan, but I hated Michael Jordan and the Chicago Bulls. Of course I would have loved for him to be a Detroit Piston, but that wasn't in the cards. With that said, I've never owned a pair of Jordan shoes, although I wanted one particular model, the Air Jordan VI. Who knows, one day I may grab a pair. Fast Forward to 2015, I haven't been a Detroit Pistons fan in who knows how long, and now I live in Chicago. Isn't it funny how life works out? I have since come to appreciate the accomplishments of MJ and his contributions to the game, not only on the court but off the court as well. I am surrounded daily by the fruits of MJ's labor and the love folks have for him in this city. When my brand grows up, I want it to be like the Jordan Brand- an asset itself, but can be a powerhouse with the right partnerships and collaborations. I want Kevin Davis Brand to be that brand to be affiliated with, and have the same dignity of simplicity and consistent execution as the Jordan Brand. 2015 has been a pretty big year for Nike and Jordan Brand fans. Back home (unless you're a Michigan State Fan), you were pretty geeked up about this partnership coming back home to Ann Arbor. The internet sort of went nuts as the University of Michigan announced they were reestablishing their partnership with Nike Team Sports, and that Jumpman would be providing uniforms and equipment for their football team. The excitement behind this partnership goes back to when Michigan's basketball team was dope in the 90s, and made waves in the NCAA. 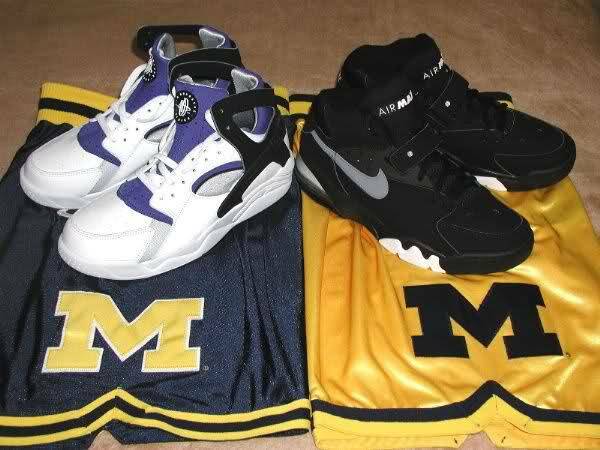 This blessed union between Nike and Michigan gave us the Air Flight Huarache shoes, the signature long basketball shorts, and low black socks adorned with the Nike swoosh- which were all unheard of in that era. So for us Michigan fans, this is a return to the golden era of Michigan Athletics, not just on the basketball court. You know, connecting product and/or brand with a life experience- all that marketing stuff, right? So, as you see was quite excited to see this type of partnership come to life less than three miles from my home after the Michigan announcement. The other big announcement sandwiched between the Michigan/Nike/Jumpman and the 32 South State Street announcements, was the collaboration between the Jordan Brand and Supreme. Supreme is known primarily as a skateboard culture company specializing in apparel, which has it's own cult following, to which my teenage sons are within that number- unless they aren't anymore, their brand loyalty is as consistent as midwest weather most of the time. After seeing tons of videos and posts from the Jordan Brand Facebook page, I decided to head downtown after a meeting to check out the new store. You can't miss this store, which is in the middle of one of the busiest shopping districts in Chicago. Amidst all of the skyscrapers and glossy storefronts, you are greeted by a simple white facade with horizontal lines and a Jumpman logo with a glowing outline. It almost looks like an art gallery, which isn't that far off once you go inside. Footaction and Nike wanted to make sure this venture was truly "From Chicago, For Chicago", which is the consistent message through out the store and is on display before you enter the it. In the front window, there are two sculptures designed by Chicago artist, Hebru Brantley, who is known for his playful characters sporting goggles appearing in many areas of the city. The figures, one black and one white, are his interpretation of the iconic Jumpman logo. On the left wall as soon as you enter the store, another Hebru Brantley original can't be missed. He painted Micheal Jordan with his signature goggles you find on many of his art works. Along with Hebru Brantley, another Chicago artist has work on display in the store, TrashHand. TrashHand is a dope photographer I began following on Instagram a few years back. It's cool to see him go from social media photographer, to doing iPhone photography course at the Apple Store. Many of his shots are lining the walls of the new store, and special edition shirts were also available for sale during the grand opening featuring his photos. Jordan artifacts line the display case beneath the huge Hebru Brantley mural. On the other side of the wall is the Footaction store, which was unlike any I have seen before. There are many special and limited release items in the store, again you can't miss the connection to the city in the store. During my visit to the store, I was able to meet one of the sales associates, Caleb, who happened to be a marketing student at University of Illinois at Chicago (also known as my day job). He gave his school a shout out after seeing the logo on my jacket (I'm always representing something when I walk out the house). Being a brand geek, I stopped and talked to Caleb about the new store and what it meant to him. He said the already loves working there and that Nike has taught him so much about marketing, placement, and positioning as it related to appealing to the buying signals and senses of customers. I think the store is dope and I plan on returning one day after work, when the crowd is smaller and I can truly explore it. I do wish I could have gone upstairs and seen the indoor basketball court and training facility, also known as "Station 23" . Those areas are not open to the public daily. If you are a Nikehead or sneakerhead, or just someone who appreciates dope things, it's worth the trip down to 32 South State Street and taking it all in. if you are into the sneaker culture, you already know the price points inside of the store LOL. I'm a fan because of the marketing campaign, the branding, and the commitment to making this a local thing.